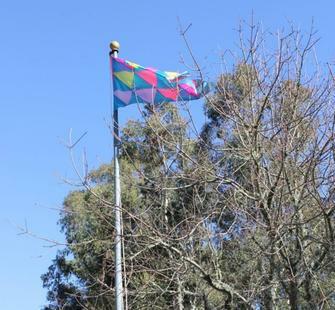 Flourish: Artists Explore Wellbeing is a multi-disciplinary programming initiative about health and happiness organized by the Lucas Artists Residency Program at Montalvo Arts Center. This multiyear program spanning 2013-14 seeks to explore the questions: how can we cultivate meaning and contentment in our lives? How do we flourish? 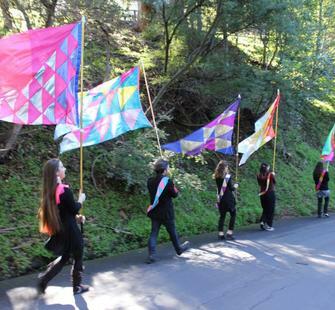 Developed in collaboration with Montalvo’s Education Program, the initiative includes exhibitions in Montalvo’s Project Space Gallery and throughout its 175 acre Public Park, as well as performances, participatory engagements, workshops, conversations and screenings in various venues throughout the property and off site. Flourish: Artists Explore Wellbeing investigates the intimate interconnections between personal wellbeing, thriving communities and a healthy planet through a series of related topics. The interrelated health of the body, mind and spirit. Countries with advanced economies like the US are nevertheless experiencing severe health crises among their citizenry, including such mental illnesses as depression and attention deficit disorder and physical ailments like obesity and diabetes. How do we attain good emotional and physical health? How does emotional stress impact the healthy functioning of our bodies? How do our mental, emotional, physical and spiritual experiences overlap and inform our sense of wellness? The intimate relationship between what we eat and how it is produced and human, social, environmental and economic wellbeing. Increasingly, we are recognizing the importance of food nutrition for our cognitive and physical health, as well as the inequities and threats associated with current food production policies. How does sitting down for a meal promote emotional and physical nourishment? How does it cultivate a sense of community? How can we support environmentally sound agricultural practices? The important role that social relationships play in emotional wellbeing. Research suggests relationships shape our personality and influence our physical and mental health. Through high quality social relationships we experience affection, intimacy, and nurture, all of which fosters wellbeing. How do we build strong communities with high degrees of trust and empathy? How can we support family life? How can we practice compassion for others and for ourselves? The critical relationship between individual wellbeing and our environment. As earth’s life support systems ─ food supplies, clean water, stable climate ─ necessary for human health and wellbeing continue to deteriorate, how do we forge new sustainable relationships with the various ecologies upon which we so intimately depend? How do we develop a better appreciation and understanding for the intimate connection between the health of our natural environment and individual wellbeing? The affinities between play, creativity and wellbeing. Play, as an exercise of the imagination, enables us to test out possible models of behavior and broadens our perspective and capacity for creativity, innovation and collaboration. Today we are increasingly spending more time in front of electronic screens and less time engaged in out-door play. This development has serious physical and mental health consequences, particularly among children. How can Montalvo’s 175-acre Public Park become an arena to explore the intersection between play and wellbeing? View & download the full curatorial statement here. Final Fridays: May 2013 Celebrate Art on the Grounds! Final Fridays: June 2013 Owen Driggs: Can Artists Heal Nature? Final Fridays: October 2013 Opening reception for "Mountains in My Spoon"
Final Fridays: Closing Reception for "Mountains in My Spoon"
Final Friday Art Party: La Love Closing Reception for "L O V E"